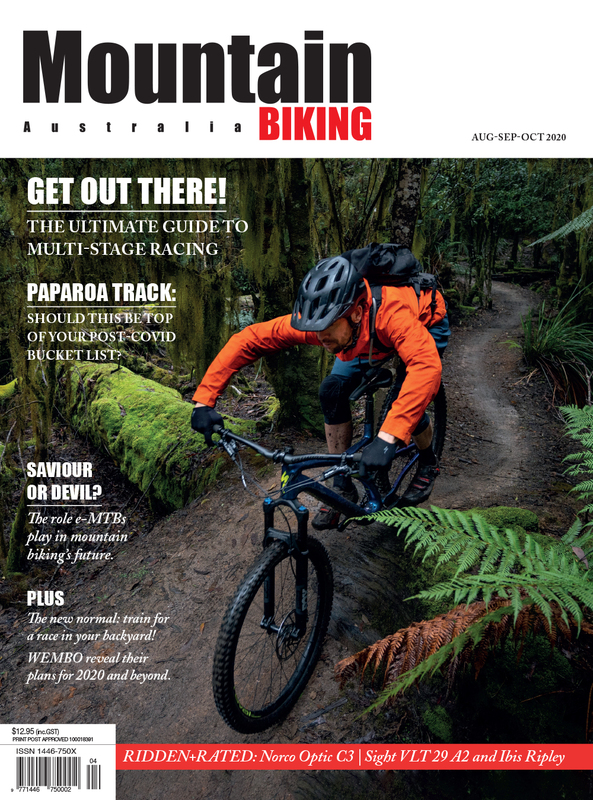 Where else can you talk to the mechanics without having to get off your bike? 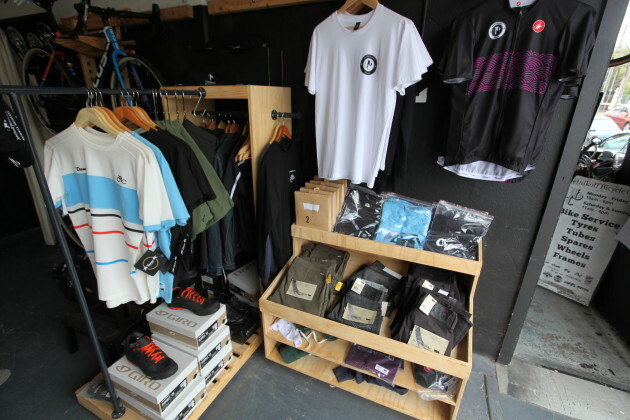 Jetnikoff’s clothing range includes Levi’s 501 Commuter jeans and other urban cycling gear. 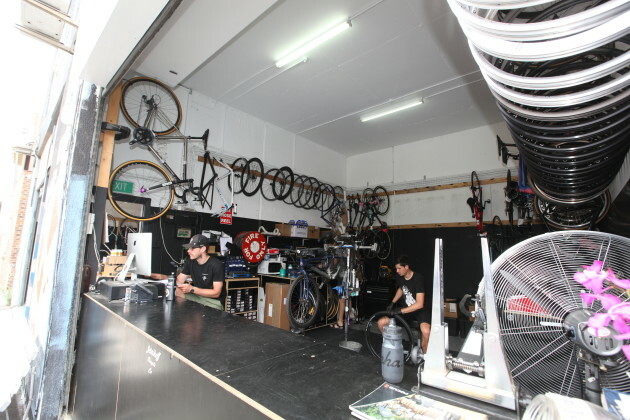 The premises may be basic, but it’s well stocked with carefully selected bikes and p&a that caters for their local market. 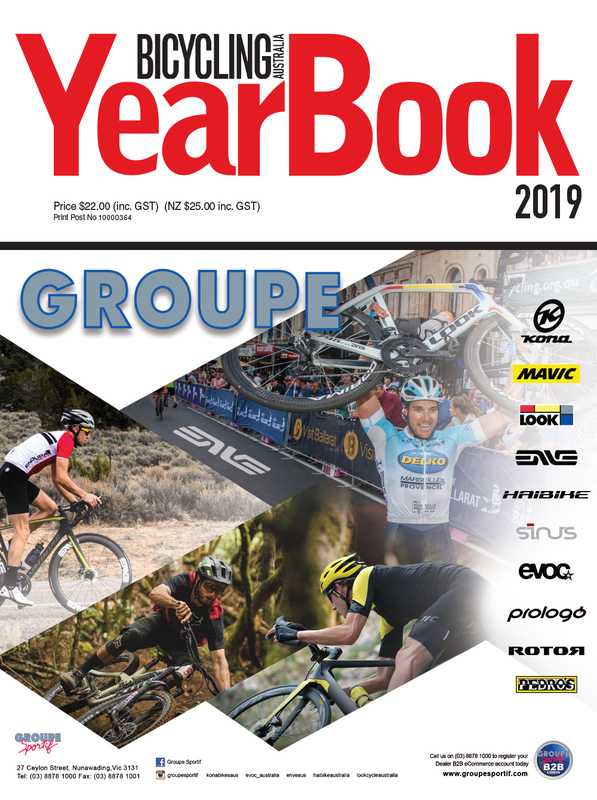 Their main bike brand is Focus. 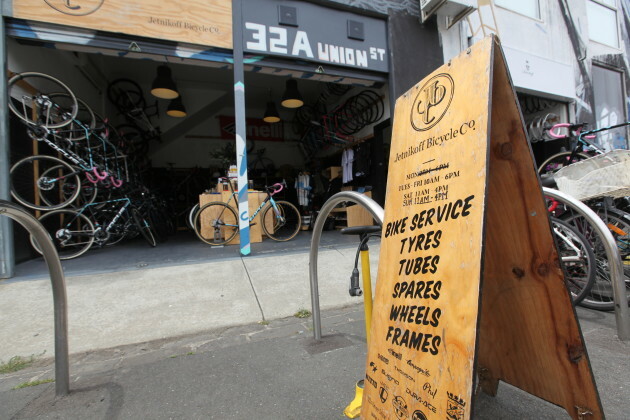 A pump for free air next to their sandwich board sign gives passing cyclists a reason to stop. Most of the cyclists going past are commuters, utility or recreational riders. 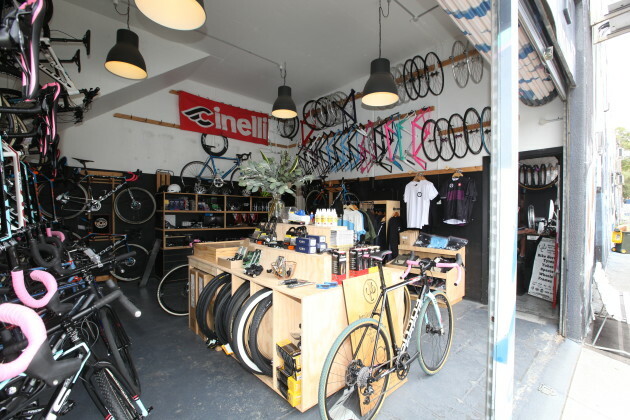 Here’s a cyclists’ eye view of Jetnikoff Bicycle Co as they ride past. From left to right: Robbie Hannibal, William Jetnikoff and Lars Zwetzschke. Street presence is a term you’d typically hear commercial real estate agents using when they’re trying to sell or lease you an expensive premises. 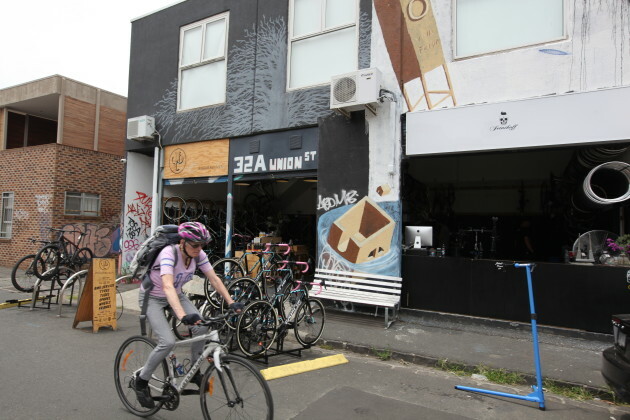 They use it to describe how wide the store frontage is, how visible the shopfront is from the street, signage opportunities, passing traffic and other virtuous attributes along these lines. 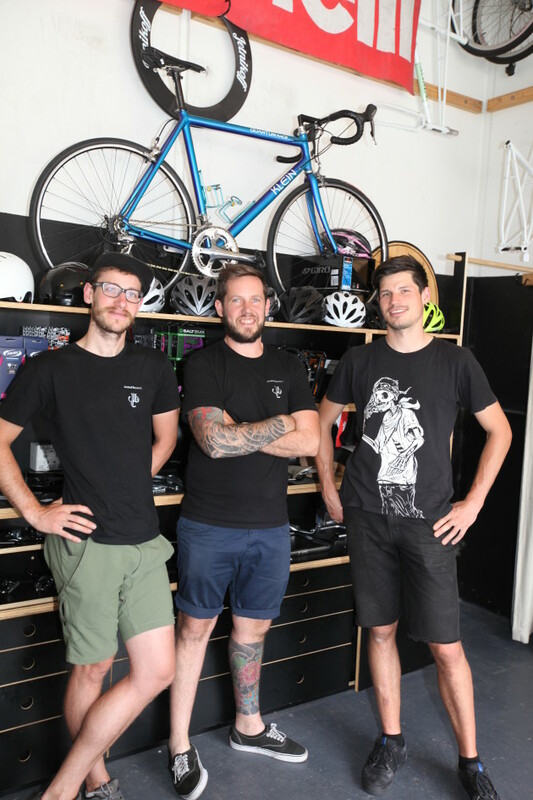 But Jetnikoff Bicycle Co, located in the inner northern Melbourne suburb of Brunswick, has turned all of this conventional retailing wisdom on its head. They’ve moved into a small, low rent, semi industrial space located on a dead end street that has virtually no car traffic at all. Jetnikoff’s interpretation of street presence is that they literally do business on the street. Their premises has no shop windows at all. Once the big roller shutters go up, it’s completely open like a market stall. 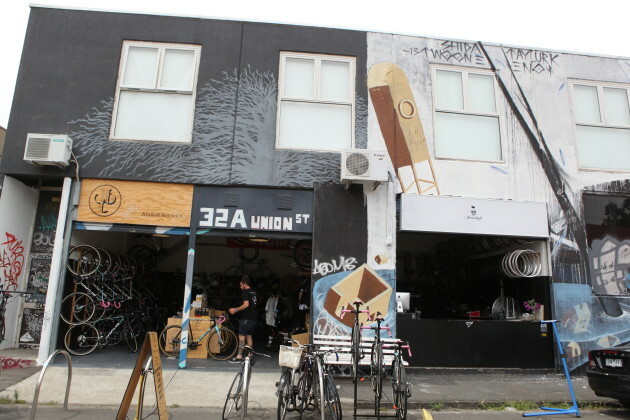 Some of their bikes for sale are displayed on the street and a shop counter fronts the street so that customers stand on the footpath. There’s also a park bench, customer bike parking and a repair work stand all out on the street and footpath. 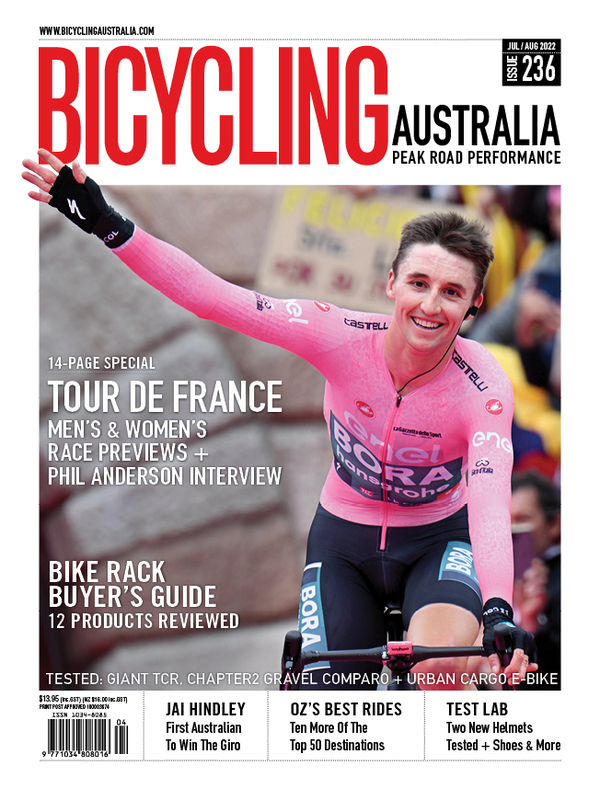 And the street itself, while it may be a dead end for cars, fronts the Upfield bike path that runs all the way along a suburban railway line, meaning that a steady stream of cyclists goes past them all day, every day. From this small space, that he opened from scratch just three years ago William Jetnikoff now runs a busy shop that employs up to five people in total. Although he says that the working space only practically caters for three staff to be on duty at any one time. You would think that having the western wall of your premises completely open to the elements would get terribly cold in Melbourne’s winter, but William says hot summer afternoons when the sun is shining directly inside are more of an issue than cold winters. 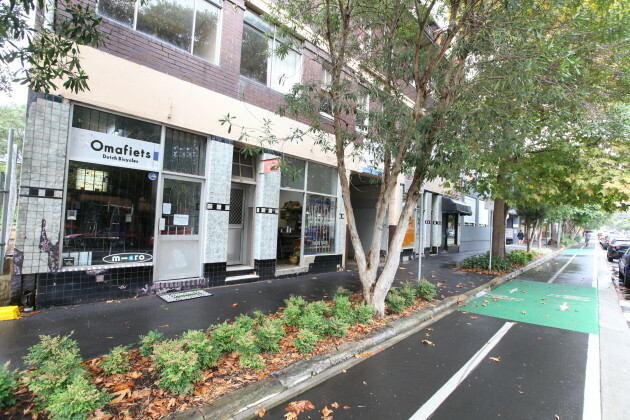 Omafiets has a tiny street facing shopfront which is a separate showroom to the main store that is down the laneway entrance that you can see about 10 metres further on. They deliberately chose this premises because it’s on the George Street protected cycleway which you can see in the foreground.